Add at least 10,01 TL worth of items to your cart to get your discount. Not in Turkey? Choose your country's store to see books available for purchase. 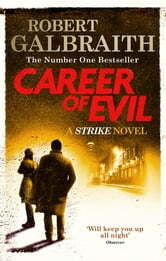 Her boss, private detective Cormoran Strike, is less surprised but no less alarmed. There are four people from his past who he thinks could be responsible - and Strike knows that any one of them is capable of sustained and unspeakable brutality. A fiendishly clever mystery with unexpected twists around every corner, Career of Evil is also a gripping story of a man and a woman at a crossroads in their personal and professional lives. You will not be able to put this book down. I never normally read serial killer whodunnits as I find them too upsetting, and I still rather regret that JKR has got into this genre, but I really liked the powerful pro woman way this is written. The plotting is brilliant but what sticks with you is the descriptions of domestic violence and deprivation. All of the sexual relationships in the novel are depicted with the complexity of real life and in a very non p.c. way. I still find both Cormoran and Robin wonderful characters and now there are other great characters like Shanker. The story of Leda Strike is becoming fascinating too. I can't wait for the next one! From the first page to the last, the writer immerses the reader into the rich story line. As the characters develop the detective has you working hard along side of him to solve the case. This could be described as the best of three but how to choose when you can re read the stories again. Please bring out the next installment soon. A devoted follower. I loved reading this book soo much!! After reading the first two, I was on count down for this to be released! Each chapter gets better and better, pulling you into the storyline until you can't help but make your own assumptions and develop expectations. Brilliant bang on the money read . Stayed up reading until 1am to get to the climax, cannot wait for the next Strike.